Below is an overview of the three parts included with Math on the Level 2nd Edition. The Curriculum Resources has three sections: Overview and Record Keeping shows you how to get started and use a placement 5-A-Day process to place any child in the program. It also shows how to set up and operate the 5-A-Day scheduling spreadsheet and 5-A-Day Online Essentials to generate 5-A-Day review papers. The Math Adventures section has ideas on how to teach math through practical daily-life activities like cooking, using money, traveling, and even playing games. These family activities help the child better comprehend and see math as relevant, practical and fun. Other chapters include a Family Math Vocabulary and ways to include math instruction in Unit Studies. Math Resources covers Charts, Graphs and Set Theory, practical ways to teach how to solve Word Problems, a Math Dictionary, and different ways to help your children memorize math facts. The Combined Teaching Guide has four sections. Operations covers addition, subtraction, multiplication, and division of positive and negative numbers, advanced concepts like roots, exponents, variables, scientific notation, and graphing equations. Geometry and Measurements covers shapes and formulas for perimeter, circumference, area, and volume. Measurements include time, weight, length, and volume. Other concepts include coordinate planes, positive and negative numbers, a measurement reference section and a glossary. Money and Decimals uses money as a practical way to teach decimals. the concept of place value, and math operations on decimal numbers. It also covers related concepts like reading numbers, rounding, percents, and computing tax. Fractions covers the concept of a fraction and then addition, subtraction, multiplication, and division of fractions. Other topics such as cross products, reciprocals, rates, ratios, and probability. The teaching ideas address different learning styles and emphasize practical, daily life applications, including the use of manipulatives to help each child understand and enjoy the lesson. The Online 5-A-Day Resources provides the 5-A-Day Scheduling spreadsheet and one year subscription to 5-A-Day Online Essentials to schedule and create the individualized 5-A-Day review papers. For those who prefer manual scheduling and creation of 5-A-Day review papers, it also includes downloadable Review Chart and 5-A-Day Scheduling forms plus an e-book with the original 5-A-Day problems from the four "Classic" teaching guides. Below is quick overview of the seven volumes included with Math on the Level Classic. Inside this volume, a complete Getting Started section teaches you the Math on the Level system and helps you place any child in the program without stress. The initial review process will also locate gaps your child may have in math. The complete record keeping system includes the Concept Chart, which shows where to locate the teaching ideas and review problems for each concept and also provides a simple way to keep track of what each child has learned. Each child's Review Chart helps you plan the on-going 5-A-Day reviews to ensure no math skill is lost. In addition to the paper forms, an auto-scheduling spreadsheet is included which takes the work out of scheduling the 5-A-Day reviews. The Operations teaching guide starts with very early topics (beginning counting and recognizing numbers) and goes on to cover addition, subtraction, multiplication, and division of positive and negative numbers. Operations also includes many advanced concepts such as roots, exponents, variables, scientific notation, and graphing equations (to name a few). It has a variety of teaching ideas that address different learning styles and emphasize practical, daily life applications, including the use of manipulatives to help each child understand and enjoy the lesson. It also provides practice problems with full solutions for each concept. The Money and Decimals teaching guide uses money as a practical way to teach decimals. Starting with identifying and counting money, it introduces decimals and the concept of place value, followed by math operations on decimal numbers. It also covers related concepts like reading numbers, rounding, percents, and computing tax. There are practice problems (with answers) for each concept. This teaching guide works particularly well with the "Shopping" Math Adventure. Concepts are taught with practical, daily life applications to help the child understand and enjoy each lesson. The Fractions teaching guide starts with the early concepts of matching objects and understanding half and whole, followed by very simple fractions. It goes on to cover addition, subtraction, multiplication, and division of fractions and other related topics such as cross products, reciprocals, rates, ratios, and probability. Because fractions are commonly used in cooking, the Fractions teaching guide works particularly well with the Math Adventure section on cooking. The teaching guides are organized to help you teach your whole family together, with each child learning at his or her own level, as you use practical activities and family-centered teaching methods. Math on the Level uses the term "geometry" for learning basic shapes and formulas for perimeter, circumference, area, and volume. Since measurements are often done on geometric shapes, the volume also includes measurements. Starting out with simple patterns and basic shapes, Geometry and Measurements covers time, weight, shapes and formulas, coordinate planes, positive and negative numbers, and many other related concepts. It includes a reference section on customary and metric measurements and a useful glossary of geometric words. Concepts are taught with practical, daily life applications, using manipulatives and activities to help the child understand and enjoy each lesson. Math Adventures is filled with helpful ideas on how to teach math through practical daily-life activities the whole family can enjoy. It's sections include on teaching math while cooking, using money, traveling, and even playing games. Since these are normal homeschool activities, you can teach in ways the child can better understand and retain. This practical approach helps the child see math as relevant, practical and fun. A Math Vocabulary section has words to use in family conversations to help familiarize the child with upcoming math concepts. Another section shows how to include math in Unit Studies that usually are otherwise restricted to topics like literature, history, language arts, or social studies but (until now) exclude math. The Math Resources book contains information (like Charts, Graphs and Set Theory) taught as a math concept but also useful in other subject areas, like science and history, and in many other practical areas of daily life. This volume includes practical ways to teach your children how to approach and solve Word Problems. In addition to a Math Dictionary, it also covers different ways to help your children memorize math facts. (An additional resource is the 9's Down Math Facts program, sold separately.) Like the rest of the Math on the Level curriculum, each idea contained in Math Resources reflects an extensive background of working with children with different learning styles plus home schooling. These are separate products designed to help children to master basic math facts. 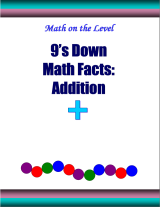 The 9's Down Math Facts Addition e-Book contains math timing sheets to print for your family to give practice addition facts, starting with 9's and working down. This file is delivered electronically, and you use a printer to produce the timing sheets. The 9's Down Math Facts Subtraction e-Book contains math timing sheets to print for your family to give practice subtraction facts, starting with 9's and working down. This file is delivered electronically, and you use a printer to produce the timing sheets. 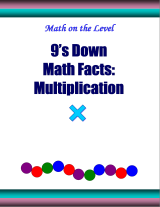 The 9's Down Math Facts Multiplication e-Book contains math timing sheets to print for your family to give practice multiplication facts, starting with 9's and working down. This file is delivered electronically, and you use a printer to produce the timing sheets. The 9's Down Math Facts Division e-Book contains math timing sheets to print for your family to give practice division facts, starting with 9's and working down. This file is delivered electronically, and you use a printer to produce the timing sheets.